Hession's Sessions Guide #3 is here! Hession's Sessions Guide #3! 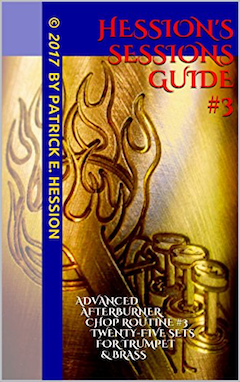 All-New supplemental series designed for use with the original Hession's Sessions Guide. The Hession's Sessions Guide #3 includes the advanced Afterburner Chop Routine #3 which includes twenty-five new sets of exercises. Cover design and Afterburner Chop Routine #3 inspired by the U.S. Navy Blue Angels. 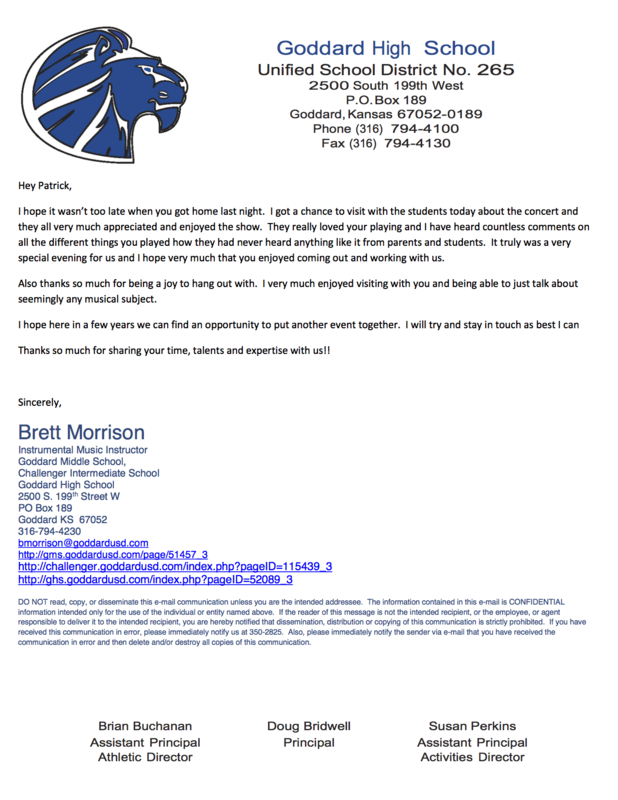 Influenced by a recently purchased Hession's Sessions Guide, Brett Morrison invited Patrick to participate in a "Maynard Day" with his Goddard High School and Goddard Middle School Jazz Ensembles in Goddard, Kansas. Patrick rehearsed with the High School Jazz Ensemble at 8:30 AM followed by a tornado drill, and then finally a clinic with the trumpet section. After lunch, Brett then took Patrick to teach another clinic at Friends University in Wichita, Kansas. 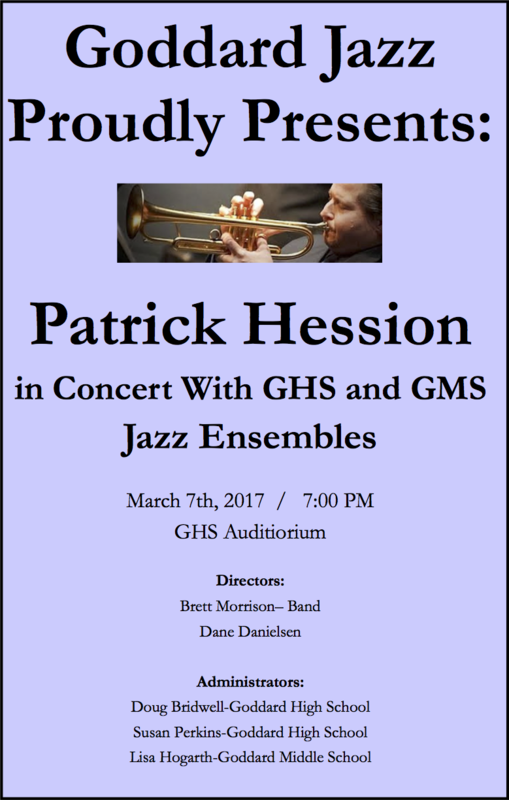 After a little break and less than 45 minutes to showtime, Patrick rehearsed with the Goddard Middle School Jazz Ensemble for their portion of the evening's concert. The evening was a huge success and the bands got a well-deserved standing ovation. Hession's Sessions Guide #2 is here! Hession's Sessions Guide #2! All-new supplemental series designed for use with the original Hession's Sessions Guide. 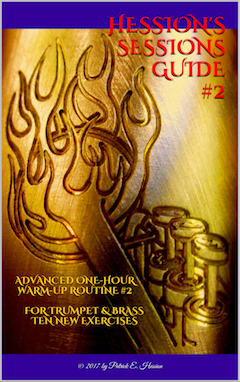 The Hession's Sessions Guide #2 includes an advanced one-hour Warm-Up Routine #2 which includes ten new exercises. Patrick was asked by director Christopher Kauffold to be the guest soloist with the John F. Kennedy Middle School Jazz Ensemble for their Holiday Band Concert on December 13th, 2016, to play Gonna Fly Now. 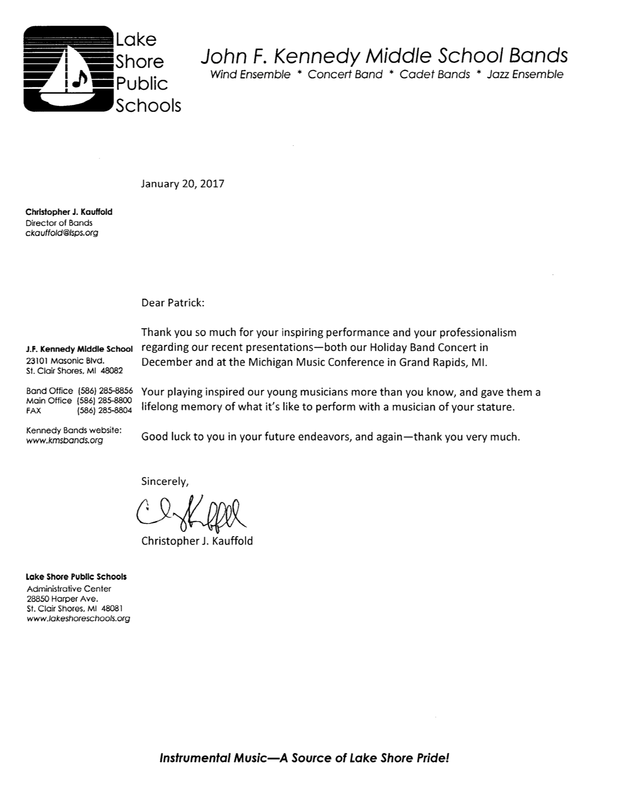 Christopher also asked Patrick to participate with them in a presentation at the 12th Annual Michigan Music Conference on January 20, 2017, in Grand Rapids, MI. 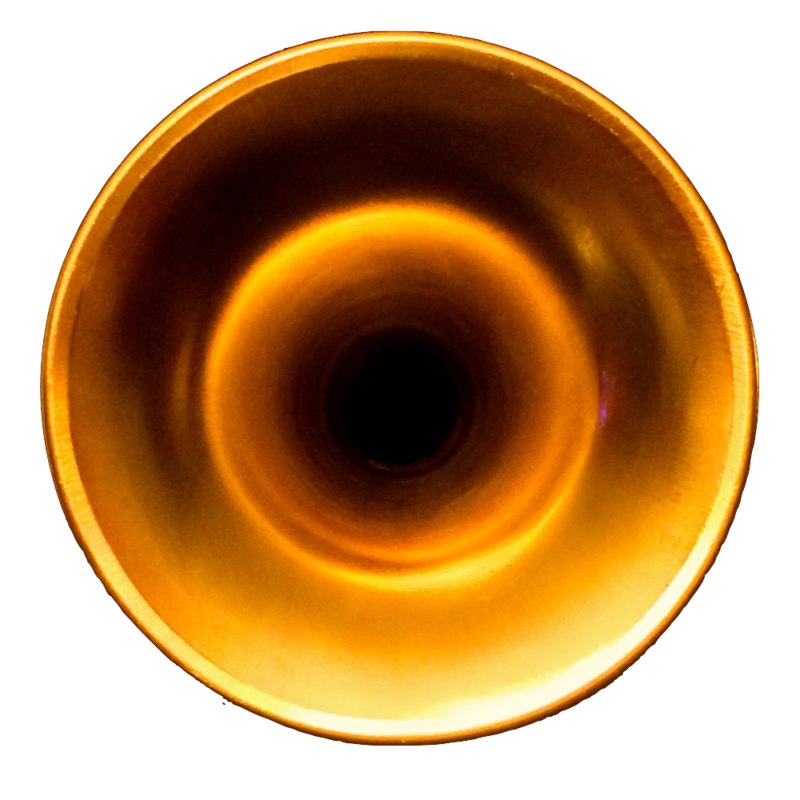 The presentation is listed below, and near the end of the presentation, Patrick spoke briefly about developing the upper register on high brass instruments before closing out with the playing of Gonna Fly Now. Hey...This Jazz Thing Isn't Really That Tough!! Learner Outcome 1: Jazz ensemble will "swing" and play in the correct style. Learner Outcome 2: Players will utilize many easy JAZZ articulations. Learner Outcome 3: Techniques in rhythm section playing will be understood and utilized. Aided by the Kennedy Middle School Jazz Ensemble, techniques to make a jazz ensemble swing and play with the rhythmic drive that it should will be highlighted. Articulation techniques, easy rhythm section "tricks" and lots of helpful hints that ANY teacher can use will be highlighted. You will take home many easy "tricks of the trade" that will have your middle or high school group swingin' like the pros! YOU CAN DO THIS, and here's how.